I’m available for private and group readings in person and by phone. You may have some questions before making an appointment. Take a minute to read the following questions and answers to help you understand how I may help you. What’s the difference between a psychic medium and a psychic? A psychic medium works on a different level than a psychic and offers a different type of information. A psychic medium connects with your loved ones in spirit and guides and angels, and shares their communication with you. Psychic Mediums are best to contact if you are grieving the loss of a loved one, wish to make contact with them, and need some proof that they really are fine and that there is an afterlife. Psychics make predictions about your future by accessing information from your energy field. They may also use tarot cards, palmistry, personal objects, etc. to aid them in making these predictions. As a spiritual medium I don’t need to use any props, as I receive information directly from your loved ones in spirit who care the most about you. I will give information about your future if it is given to me by your loved ones, guides and angels. I work through my heart with deep gratitude for the ability to communicate with these spirits for your benefit. I am also a psychic/spiritual intuitive and can help you to make choices about your future that are in your best interest without using any “props”. You may have questions about relationships, family, work, physical location, health and more. I work with your guides and mine to offer you the best spiritual guidance available to you at the time of the reading. How do you receive information from my loved ones in spirit? I use my clairaudient and clairvoyant gifts to communicate with your loved ones in spirit. I’m able to hear them and receive visual impressions of them and of meaningful objects or symbols that confirm for you that I’ve made a connection with your loved one. I often can feel their personality and emotions as well. They are in a beautiful place and may come through with humor and playfulness. If they feel they need to make amends or apologize, they may also do that. In addition, they want you to let go of any guilt you may feel about their death or anything you did or didn’t do before they made their transition. Can you contact anyone I want to hear from in spirit? There is no guarantee that a specific person will be available to communicate with you at your sitting. Each spirit is continuing its journey and healing process and may or may not be able to make contact when you desire. However, spirits will make a great effort to connect with you because they love you and may even want to make amends from the other side so that you and they may heal your relationship. I make every effort to connect with all who are able to come through. Some spirits come through powerfully and with great personality and others may just come through with a brief hello. Sometimes the one you least expect to hear from has the greatest love and concern for you! (I even get messages from great-grandparents whom you have never met, but are watching over you!) 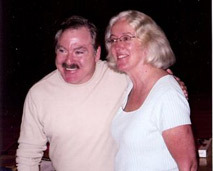 I highly recommend James Van Praagh’s book, Unfinished Business, to understand how you and your loved ones may continue your relationships and the healing process even after death. What’s the difference between a group and private reading? I host “galleries” or group readings in various public spaces and homes. A group reading is open to the public and to all who desire a message from their loved ones in spirit. People may or may not know each other at the reading but all have the desire to hear from their loved ones. Many people go to a group reading first to observe a medium and understand how messages are received. They may be skeptics and just need to see what happens! I also host group readings in people’s homes or offices for their family members, clients and friends. The host organizes the reading and invites interested people. I travel within a 150 mile radius of Great Barrington for group readings. The fee is generally $30 to $40 per person and varies according to the distance travelled and the number of people at the sitting. Group readings are about two hours long with time before and after for questions and discussion. Private readings are for one or two related people and are about one hour long. The focus is on connecting to your loved ones in spirit and any information for you from our spiritual guides. Private readings are held at my home office in Great Barrington, MA, by phone, or by prior appointment when I’m hosting a group reading in your area. What is the cost for a reading? Private readings are $150 per hour. Each additional person in a private family reading is $35. Ready to make an appointment now? Click here. We all wanted to thank you so much for our group reading. It was a very moving experience for us. You give so much of yourself in your work and I hope you know how much it means to people. I always come away with so much to think about and apply to my journey. Still getting positive feedback from my friends about our group reading and private readings you gave when you were here. Thank you for your kindness and for being there for me in my time of need. You really make a difference. You have truly been given a gift. My meeting with Carol the first time was by chance. Friends were going to the Bennington Center for the Arts and asked me to come. I have always been a ‘believing skeptic”, interested in the works of Brian Weiss, so I figured I’d go for the session. I had no expectations, just wanted to listen. As the session progressed I was amazed at Carol’s accuracy and ability to connect. Since I knew several people there well, her insight was eerily correct. Gave me goosebumps. After the session I couldn’t help but share my experience and everyone I talked to wanted me to bring Carol back. Arranging with her to come back to Bennington for 10 of my friends was very uncomplicated. The session lasted well beyond the two hours scheduled and proved again, amazing. Many long gone relatives spoke through Carol, giving those who remain , hope, comfort, love and peace, and the advice to live life to it’s fullest…. The session ended with everyone feeling fulfilled, having questions answered, just waiting for the next meeting…..
Carol is now at The Spring Wellness Center in Old Saybrook, CT once monthly for private readings and past life regressions. Call or e-mail now to schedule your appointment. Call soon for your preferred time. The schedule fills up fast!